Start by cooking the quinoa. Bring 2 cups water to a boil, then add quinoa. Simmer for about 15 minutes until all water is absorbed. When done, remove from heat and keep covered for about 10 minutes so quinoa can absorb any excess water. Preheat oven to 425. In a bowl, toss chickpeas, oil, and spices until chickpeas are evenly coated. On a baking sheet lined with parchment paper, bake chickpeas for 15 minutes. When done, remove from oven and let cool. To make red pepper dressing, add all dressing ingredients to a blender and blend until smooth. Finally, assemble the buddha bowls. 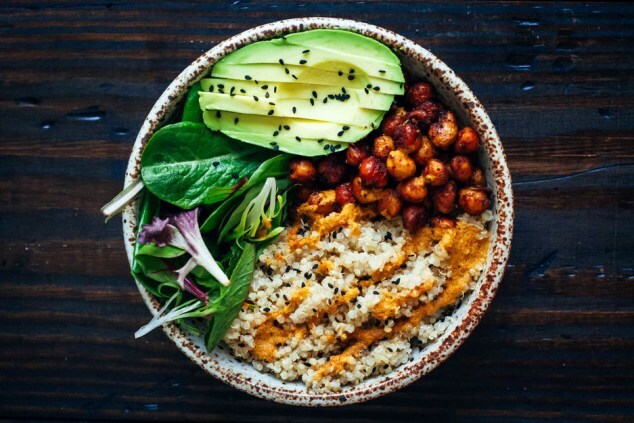 In two bowls, add quinoa, mixed greens, avocado, and chickpeas. Drizzle everything with red pepper sauce, and sprinkle with sesame seeds.